Why is my work enjoyable and fulfilling, and why am I appreciated? 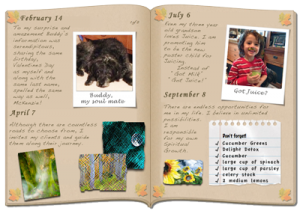 Journaling is the process of regularly writing your thoughts, feelings, ideas, events and other experiences that may have occurred in the day on paper. These journaling resources will help you find clarity. Your journal is a safe place for you explore and clarify your life and priorities, enabling you to make choices and to take action based on those choices. It will give you a sense of direction, help you learn from mistakes of the past, and greatly reduce your stress level. Journaling can be a very profound experience. The process of journaling can support you in learning about yourself, what you’re passionate about & what you aspire to. Buy yourself a beautiful notebook, and a pen you enjoy writing with. Find 20 quiet minutes in your day as part of your bedtime routine. Write in it as if you were talking with yourself. Write about how you are feeling, write about what you are grateful for, what’s bothering you or exciting you, or the day ahead of you. Writing about your own life will help you become happier and more content and will nurture your creativity. Writing about gratitude will change the quality of your life beyond belief. Journaling is the process of regularly writing your thoughts, feelings, ideas, events and other experiences that may have occurred in the day on paper. Your journal is a safe place for you explore and clarify your life and priorities, enabling you to make choices and to take action based on those choices. It will give you a sense of direction, help you learn from mistakes of the past, and greatly reduce your stress level. Your journal does not need to be well written, this is your journal for your eyes only. Write down five things that you can be grateful about that day. Some days your list will be filled with amazing things, most days just simple joys. Self expression release’s the soul’s experience into Being. Here are several poems I wrote many years ago longing for home in the Pacific North West. setting my mood, freeing my spirit.